Giant Banner 4 1/2' x 12' Cloth Banners. 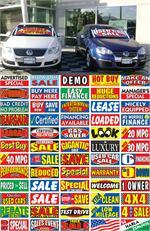 Auto Ad Sales Auto Dealer Supply Home > Lot Decorations, Banners > Giant Banner 4 1/2' x 12' Cloth Banners. Great For Windy Locations As The wind Just Travels Throught The Fabric! 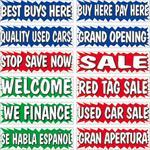 Each Of These Single Sided Giant Banners Are PrintedOn Durable Weather-Proof Cloth Fabric That Is Easy To Store. Giant Cloth Banner. 4 1/2' x 12'. 12 Nylon Straps Included With Grommets Placed On All Four Sides.